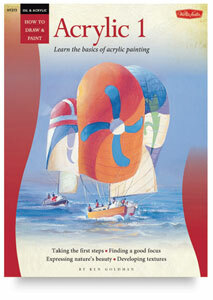 Learn the basics of acrylic painting from this "how-to" book, created for aspiring adult beginners. The late Walter Foster wrote, designed, printed, bound, and distributed his own books on art.In a lifetime that lasted over 90 years, he created an entire library of "how-to" works, on virtually every artistic medium.They are perennial best sellers in art stores. Walter Foster's works, now updated and supplemented by new authors, have become favorites of artists learning basic drawing, painting, and studio techniques.Each book in the "Starting Out" series covers basic materials and techniques,and is suitable for an adult beginner. Paperback. 32 pages. 10¼" × 13¾" (26 cm × 35 cm).